Roatan is a long skinny island located north of Honduras mainland that has become a popular port point for many Western Caribbean cruises. In fact, the cruise lines have invested large amounts of money here to ensure that visitors can make the most of their cruise to Roatan. There are many activity offerings on the island, ranging from educational eco tours to outdoor activities that take advantage of the region’s lush and tropical surroundings. However, adventure seekers need not worry; there are numerous things to do on the island that will get the adrenaline pumping. Most Roatan cruise excursions do however begin at the port itself, an area that is lacking in the adventure department. Mahogany Bay Isla Roatan is the first place that those deboarding ships experience when docking in this area, and while it is undoubtedly a tourist trap, it is an excellent place to book excursions and adventure tours on the island. We put together a list of the best five to consider to help you get started on your brief island adventure right away. 1. Scuba Diving: Getting in the water is one of the most popular activities for many aboard Western Caribbean cruises as the region’s abundance of exotic wildlife and beautiful corals and sponges make diving here almost irresistible. Popular snorkel sites can be found on the island; however, Roatan cruise excursions that involve scuba diving are markedly more exciting. It is on these deep water journeys that areas like Mary’s Place can be experienced, and although it may sounds like a stop at a coffee shop, Mary’s Place is home to one of the most exciting diving experiences in the world thanks to a literal underwater wall of black coral. 2. Zip Lining: One of the most popular Roatan cruise excursions for adventure seekers involves zip lining two to three stories above the ground among the flourishing canopies that shadow the surface. 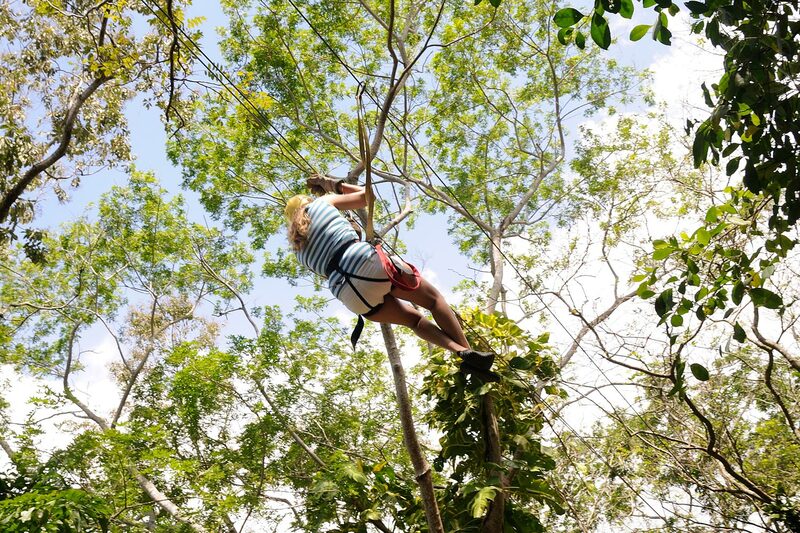 Combining the peaceful serenity of the beach with a mini snorkel adventure, the Tabyana Beach and canopy tour is a truly all inclusive way to experience Roatan as it ends with a fast paced and exciting zip line tour through the trees. After their beach encounter, guests are whisked to Creation Rock where they begin their zip line adventure, encompassing thirteen different tree top stations and eleven cable stretches. Roatan cruise excursions do not get any more exciting than this one! 3. Kayaking: Why explore Roatan from the shore when you can make your own rules and kayak around the sea? The West End is where water sports can be found, and for those that appreciate a physical challenge, kayaking Roatan cruise excursions offer an adventurous means to explore the island. Half Moon Bay Beach can also be found at the West End and it is known for its abundant palm trees and clear waters, a perfect environment for some fast paced kayaking. 4. Horseback Riding: Walking around and taking in the sights and sounds of the area can be relaxing and enjoyable, however true adventure seekers will want a less conventional way to get around. Luckily, horseback riding is available through Roatan cruise excursions and offer a way for adrenaline junkies to take a fast paced jaunt along the island’s pristine beaches and up into the verdant hills above. Roatan cruise excursions featuring horseback riding can be found on the island’s south side or at West Bay, and they feature experienced guides and all day adventure. 5. Dune Buggies Island Tour: Anyone who wants to experience Roatan away from crowds of tourists and public places would do well to hop aboard an off-roading dune buggy and take advantage of one of the roughest and toughest ways to see the island. From the white sand shores of the Caribbean to the rolling, tree covered hills of the inland, you can see it all from an off road vehicle led by experienced guides. These types of Roatan cruise excursions take guests off the beaten path and away from popular and overcrowded beach areas for a more personal experience. Anyone traveling to Roatan may want to consider adding a little adventure to their stay, and the island does not disappoint in providing ample exciting options to guests aboard cruises to Honduras. However, it is important to remember that getting to Roatan excursions in the first place may be an adventure in itself, as the island does not use familiar means of addresses and destination directions. Hop in a cab or use the locals for help to get to the jump off point for your island adventure.